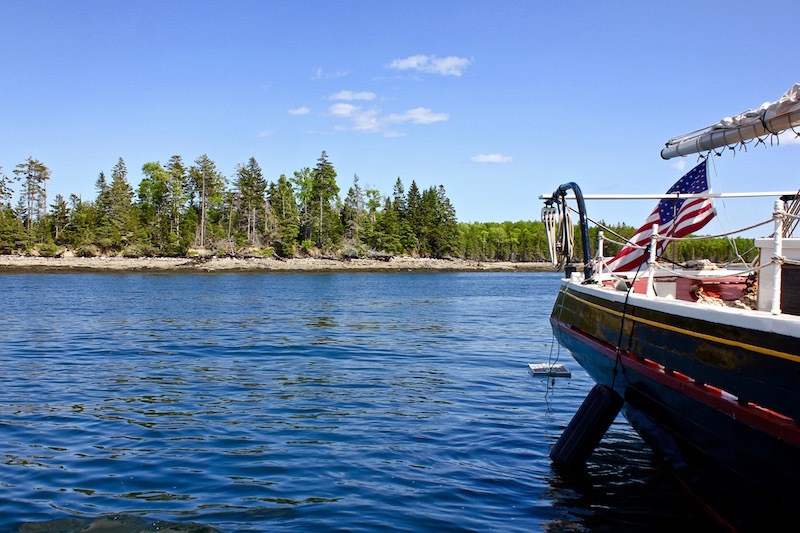 Have you ever wondered what it would be like to take a Maine windjammer cruise and leisurely sail along the state’s rocky coastline, gazing at lighthouses, feasting on lobsters, and sipping wine under the stars? Well, I got the chance to do just that in June, when I was the guest of the J. & E. Riggin out of Rockland. Read on to find out what made the trip so special. I kicked off the summer by spending a week one of my favorite places on earth – Maine. I was invited to be a guest on the J. 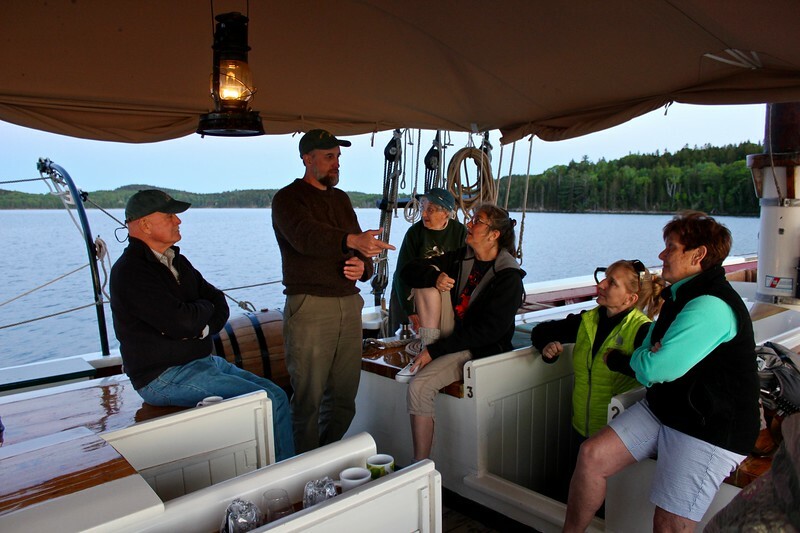 & E. Riggin – a 91-year-old windjammer schooner that sails out of Rockland – and jumped at the opportunity to spend a few days cruising Penobscot Bay on a “lighthouse and lobster” tour. 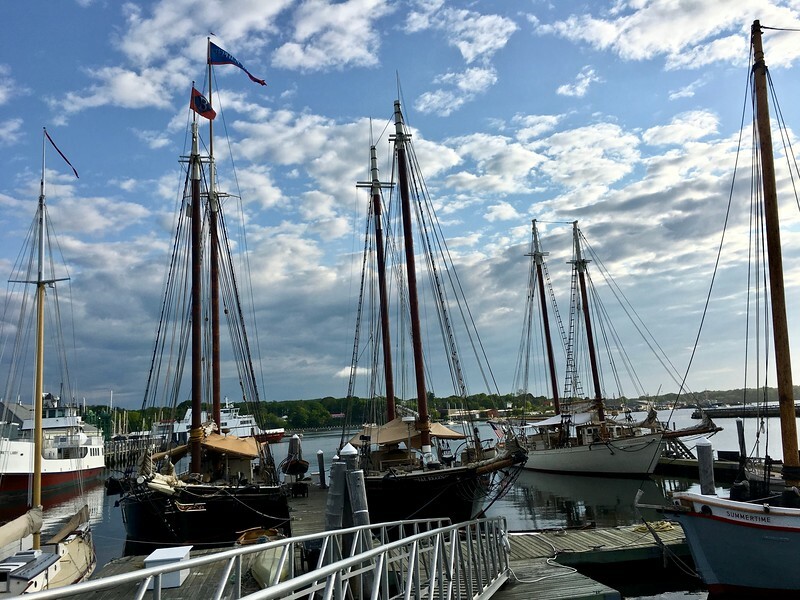 I had taken one windjammer cruise before – an afternoon sightseeing trip out of Camden, which is up the coast from Rockland – so I had some idea of what to expect. I knew that the scenery would be beautiful (it’s Maine, after all), there would be lots of fresh air and sunshine, and it would be very relaxing. But I discovered it was so much more. Here’s why. 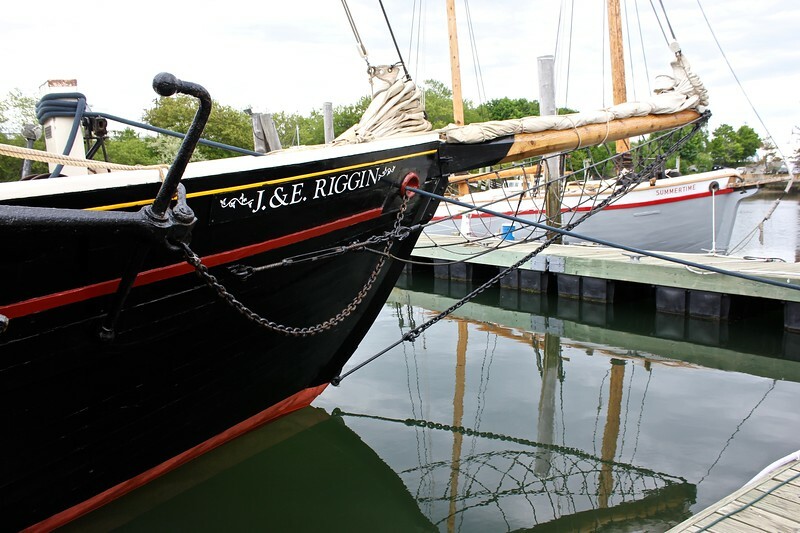 The Riggin is a National Historic Landmark vessel! You become part of the family. The J. 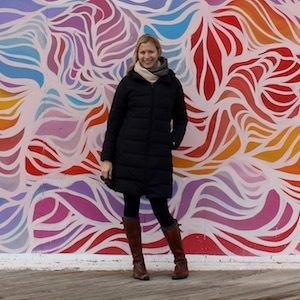 & E. Riggin has been owned and operated by husband-and-wife team Captain Jon – Cap for short – and Chef Annie – an acclaimed chef, author of three cookbooks and blogger behind At Home At Sea – for more than 20 years. Cap and Annie are native Midwesterners who have made Rockland their home and the Riggin a big part of their lives. Their college-aged daughter, Chloe, served as first mate on my trip, while their younger daughter, Ella, held down the home front. Cap and Chef Annie spend a good part of the year living on the Riggin, and they make it clear you’re more much than a passenger to them. You don’t just eat, you eat good. Chef Annie is committed to serving fresh, flavorful food to her guests on the Riggin morning, noon and night. Nearly all of the meals are made entirely from scratch in Annie’s galley kitchen – she even cranks out fresh pasta – which is comprised of her trusty wood stove, small sink and about three feet of counter space. And most of the ingredients are sourced within 100 miles of the ship from about two dozen local food vendors. Many vegetables and herbs are grown in Annie’s own garden, and the eggs even come from her own chickens (I got to meet them myself!). 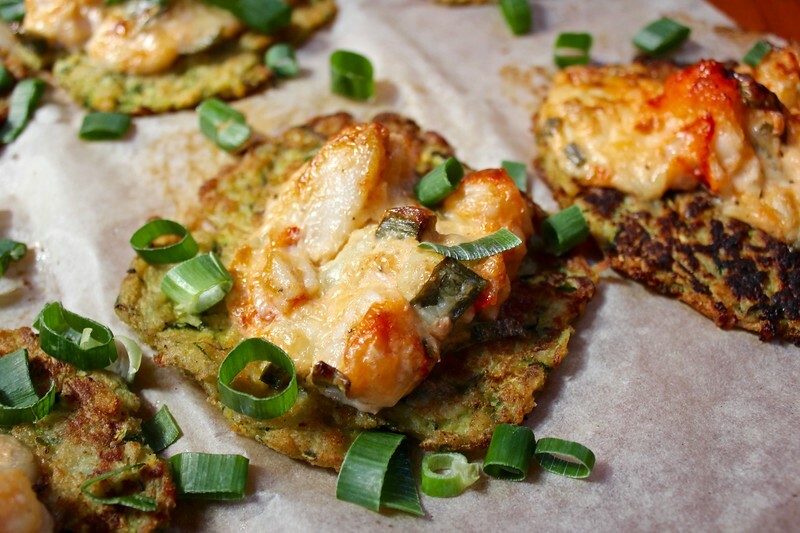 It would be really hard for me to pick a favorite meal, but I particularly loved the zucchini fritters topped with lobster that we had on the last morning. On top of that rock is a peregrine falcon nest that has been there for more than 200 years! We saw some babies’ heads peaking out. You leave a light touch on the environment. 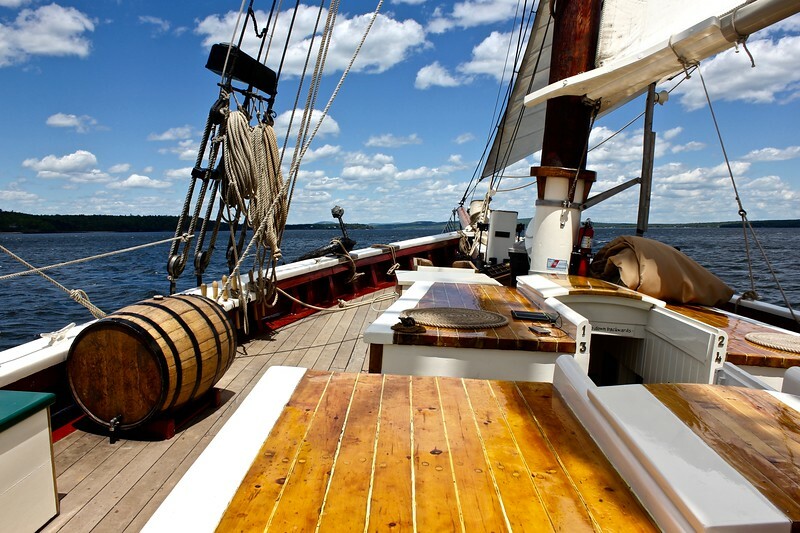 In 2008, the Riggin became the first Maine windjammer to be entirely carbon neutral/free. There is little food waste, since ingredients are used in multiple dishes as much as possible. The vegetable and paper products are composted in Cap and Chef Annie’s garden. They use recycled paper products, and there are recycling bins on board. All cleaners are biodegradable, and most are all-natural and made on site. Salt water is used for the toilets, and guests have access to fresh drinking water – no need for plastic bottles! All lights run on batteries, which are recharged back on land. You learn everyone has a story. 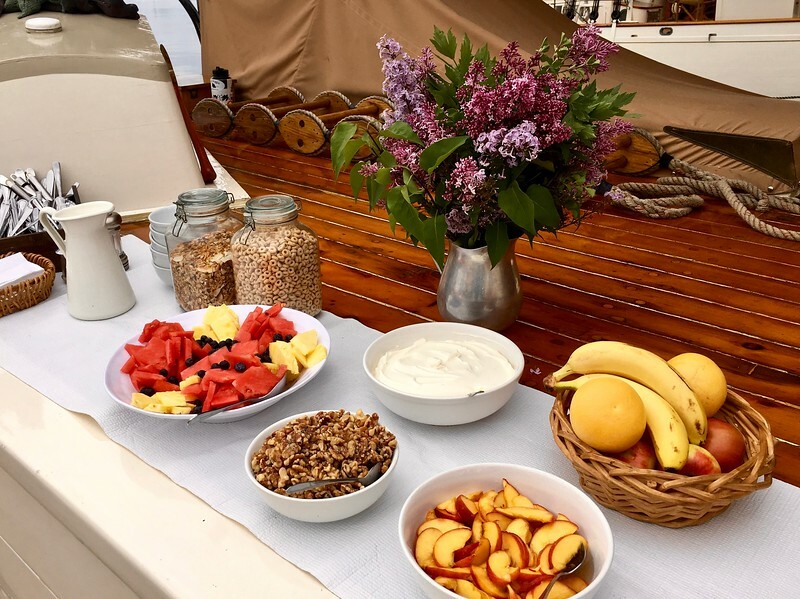 Unlike a cruise ship, where you’re surrounded by hundreds or thousands of strangers, a Maine windjammer cruise is much more intimate – the Riggin has a capacity of 24 passengers. Because our trip was one of the first of the season, there were only 13 of us – four couples, a father/daughter duo from Arkansas and a mother/son duo from Maine (the mother in that pair is 85, and the trip was her Mother’s Day gift from her children following the death of her husband). As much as I enjoyed sitting in silence and gazing at the coastline as we sailed through the Bay, I found my shipmates’ lives and backgrounds to be absolutely fascinating. I really enjoyed discussing art, history, travel, and more with them as we lounged on board. You learn you can unplug. One major perk of the trip for me is that I didn’t have cell phone service or access to Wifi – there wasn’t even electrical outlets on board to charge devices (One couple brought a solar charger, and it was mostly ineffective). 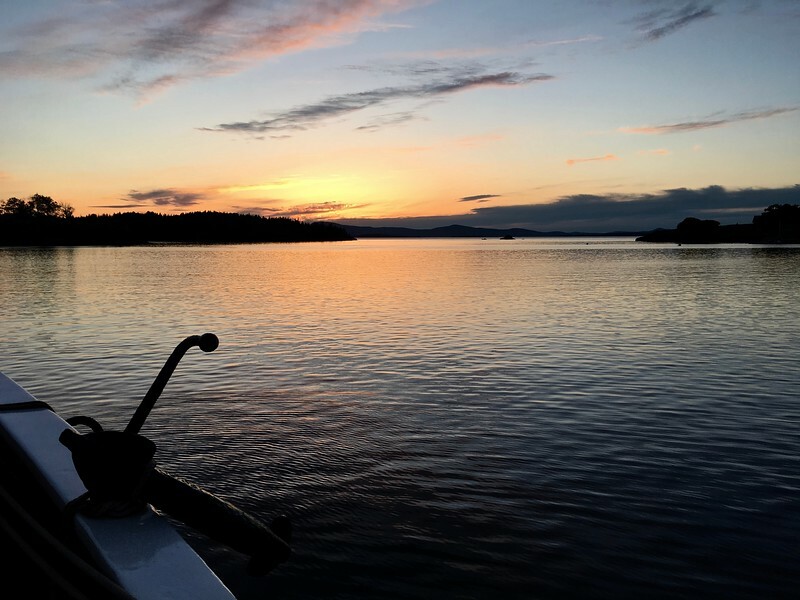 I hadn’t done a digital detox since the Nomad Cruise more than a year before, and even though I was slightly anxious about not being able to check email, of course, it was exactly what I needed. I fell asleep when my body was tired – no mindless scrolling through Facebook – and woke up with the sun. 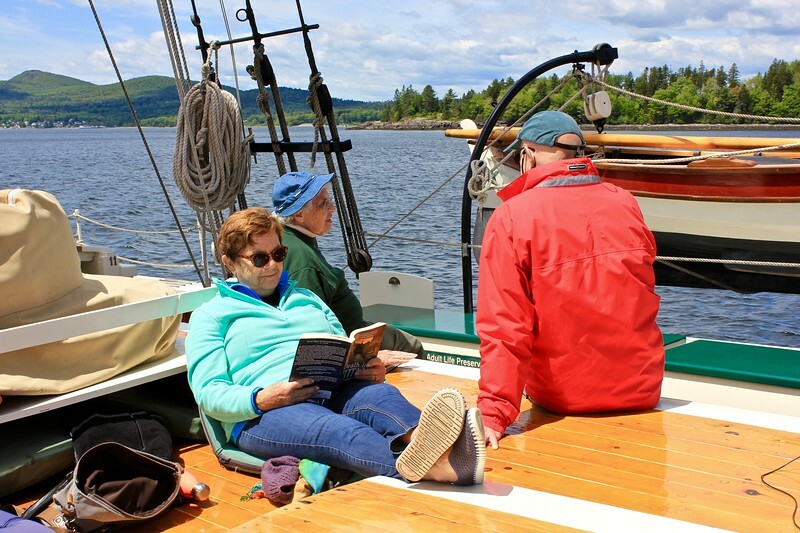 I took naps when I wanted to, and I read on deck as we sailed. I disembarked feeling fully refreshed. You can get a workout and learn a little too. Sitting around and eating is not a bad way to spend your vacation – I actually think that’s what most people prefer to do! 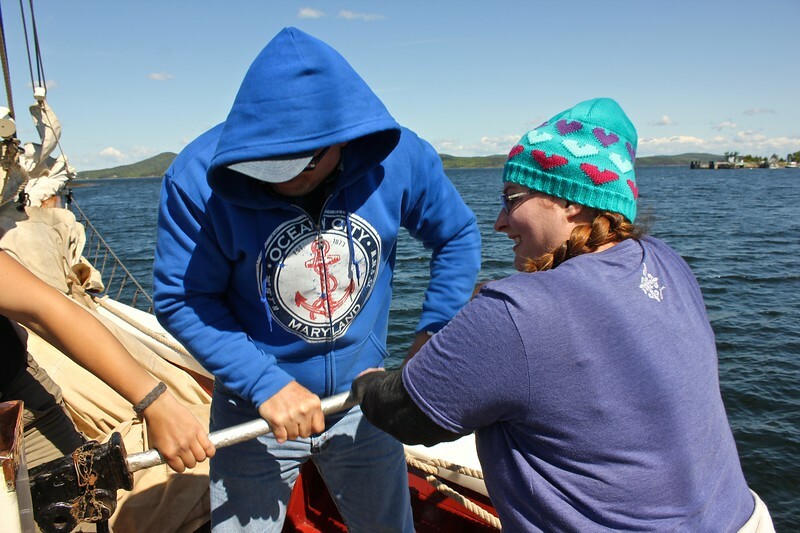 However, since I generally like to get some movement in during the day, I enjoyed pitching in on the many tasks that must be done to get an 89-ft.windjammer schooner from point A to point B, such as raising the sails and hoisting the anchor. I also found it interesting to talk to Cap about the various tools and maps he uses to navigate the Riggin through the Bay. After tasting food like this, you’ll want to become a “Riggin Relic” too! It seems many Riggin passengers can’t resist the call of the Bay – one on my fellow passengers had been on 33 previous cruises! Cap and Chef Annie affectionately refer to these repeat guests as “Riggin Relects.” You become a relic after your third trip and are then rewarded with a patch, a flag for every five years and discounts. At 6 p.m., we all gathered on deck for the “captain’s call,” during which Cap and Annie briefed us on safety, logistics and what to expect during our trip – important things like how to use the “head” (toilet) and that when Annie rings the bell, it’s time to eat! We then we were free to enjoy the town for the evening before returning to our bunks for a good night’s sleep. After breakfast we set off early to sail up the coast, passing Rockland and Owl’s Head Lighthouses. We anchored in the late afternoon off Warren Island State Park, which we reached by dinghy. Once on the island, we had about an hour of free time to explore while the crew prepped our dinner. 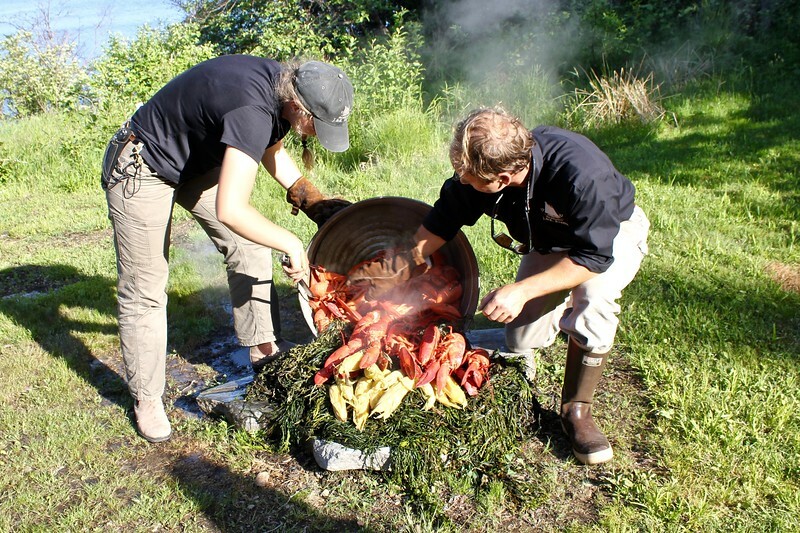 It was a memorable evening for sure – we enjoyed a traditional lobster bake followed by s’mores for dessert. Cap entertained us with his guitar before we headed back to the ship. Back on board, we sipped wine and watched a stunning sunset and then were wowed by a clear sky full of stars. 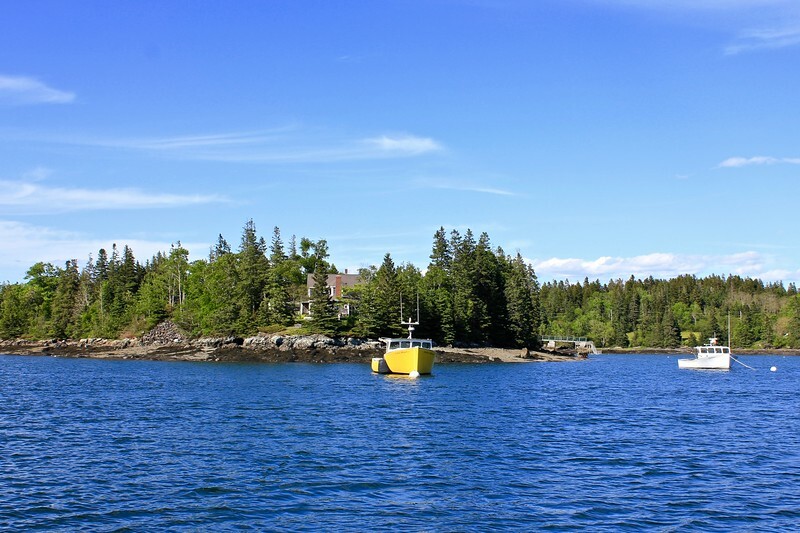 We were up and out early this morning, and after lunch, we anchored off Castine, a small town on the coast that is home to the Maine Maritime Academy. After taking the dinghy to shore, we had a few hours to explore. 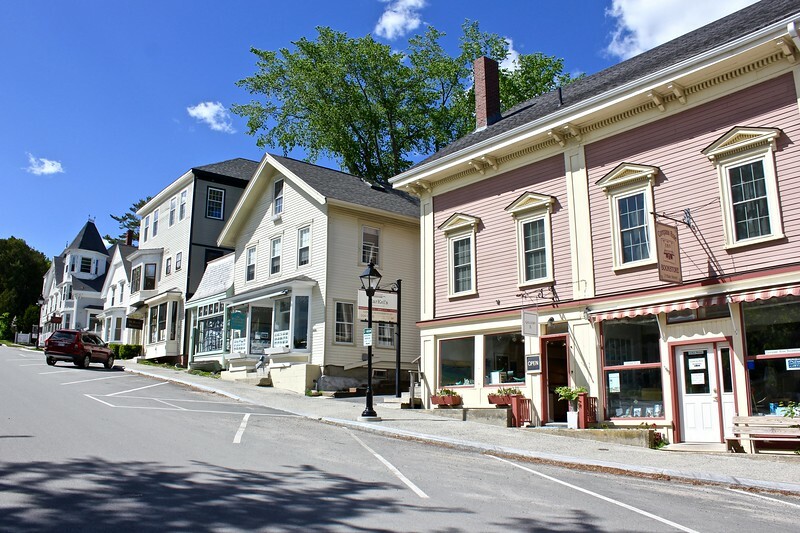 Castine is one of the oldest communities in North America, so I loved seeing all of the historic buildings. Before dinner, Annie surprised us with an olive oil tasting, and then we sailed to a nearby cove to anchor for the night. We took our time leaving in the morning, so I got to have some fun sailing around with another passenger on a six-foot boat that the Riggin carries. (I was happy that some of the sailing lessons I took came back to me!) We had a shorter sail than the other days and anchored late afternoon in another peaceful cove, after passing a rock on top of which a peregrine falcon nest has sat for 200 years (!). Annie surprised us with another snack – this time cheese and crackers – and after dinner, Cap and Annie led a lovely sing along by lantern light. 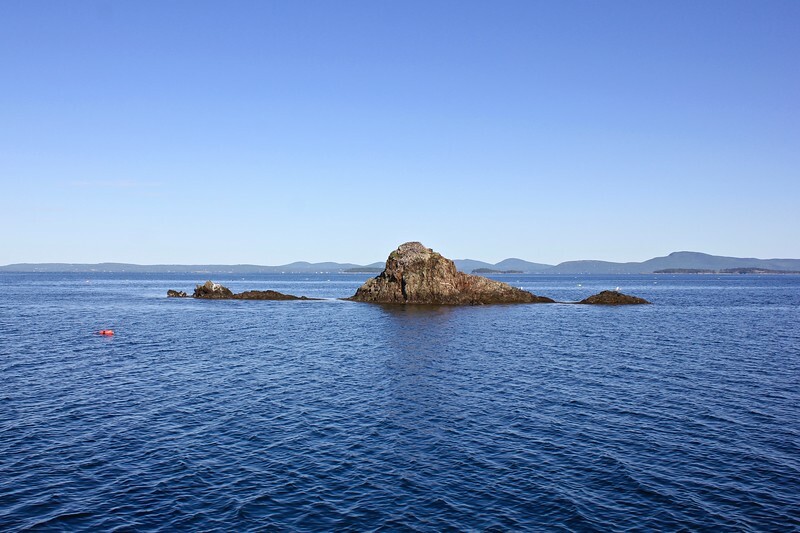 We pulled out of the cove shortly after breakfast, motoring back to Rockland, where we arrived around noon as scheduled. Reluctantly, we all packed up our cabins and hopped off the Riggin to continue our travels. I’m very fortunate that I have the opportunity to have so many unique travel experiences and meet so many wonderful people all over the U.S. and the world. But out of all my travels, my time sailing on the Riggin will likely remain one of my favorites. It was just that special. As we were disembarking, Marg – the 85-year old woman in our group – summed it up quite well. “This was healing,” she said. 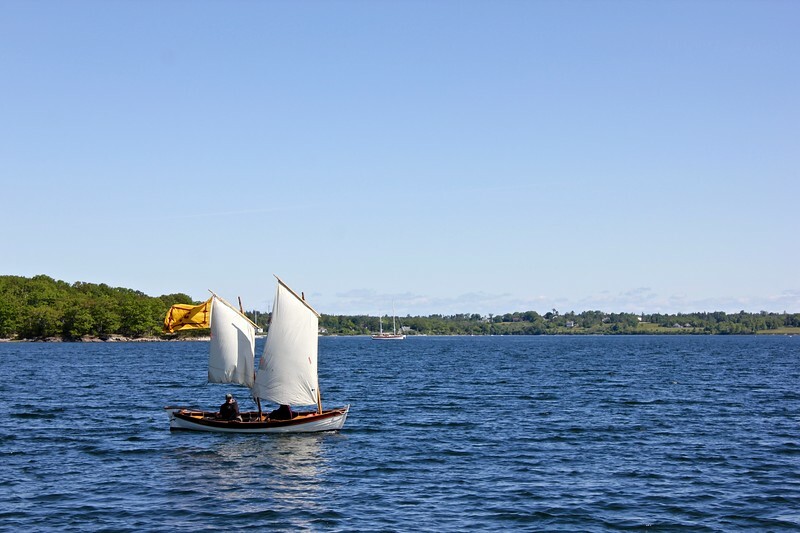 Do you want to take a Maine windjammer cruise? Thank you to Cap and Chef Annie of the J. 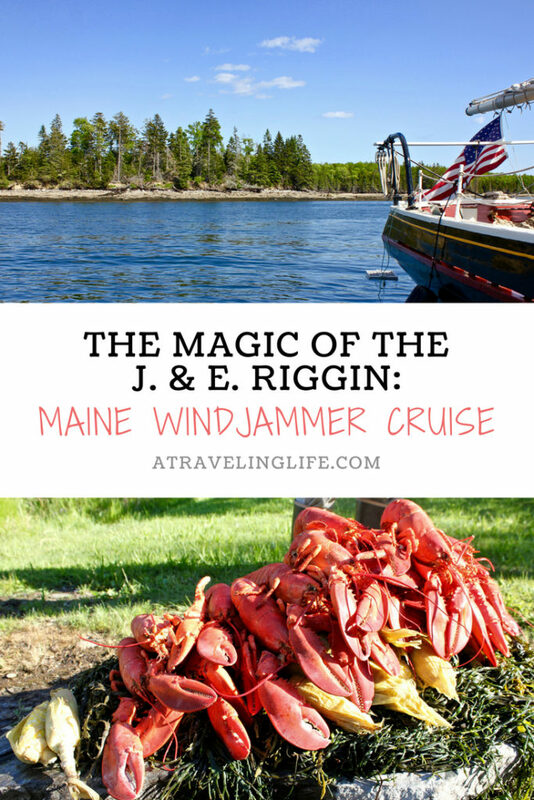 & E. Riggin for hosting me on my first Maine windjammer cruise and for their incredible hospitality.